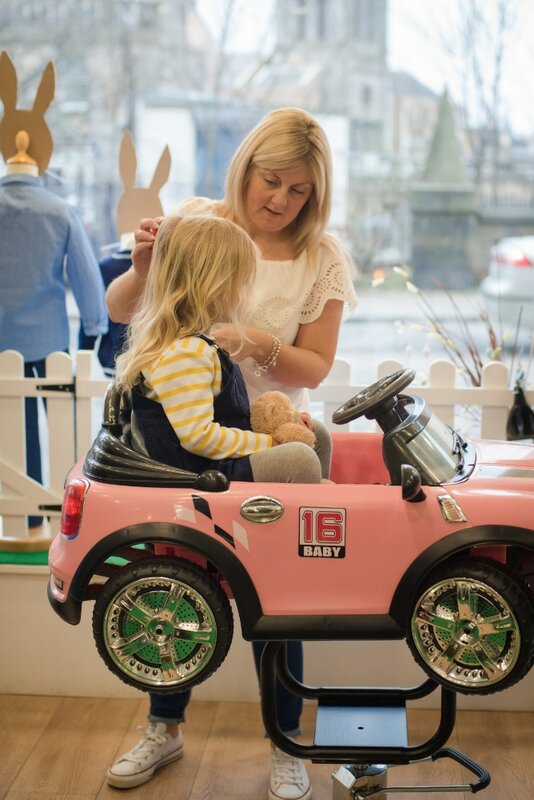 We provide an enjoyable hairdressing experience for your children with our expert hairdressers and a few special distractions, including our fun car chairs and a large selection of TV shows. Book your Treehouse appointment for any day of the week that suits you best. Here at Treehouse we have continually upheld our reputation of Edinburgh’s number one destination for children’s hairdressing since 2012. Our success is built from our priority of creating an enjoyable experience for both our parents and the little customers. The children are delighted with the choice of two car chairs to sit and play in whilst watching their favourite DVD, and their reward of a sticker or lollipop for their bravery. While our hairdressers are working their magic, the parents can relax or take a browse through our unique rooms full of inspiring shoes, toys, and clothing. 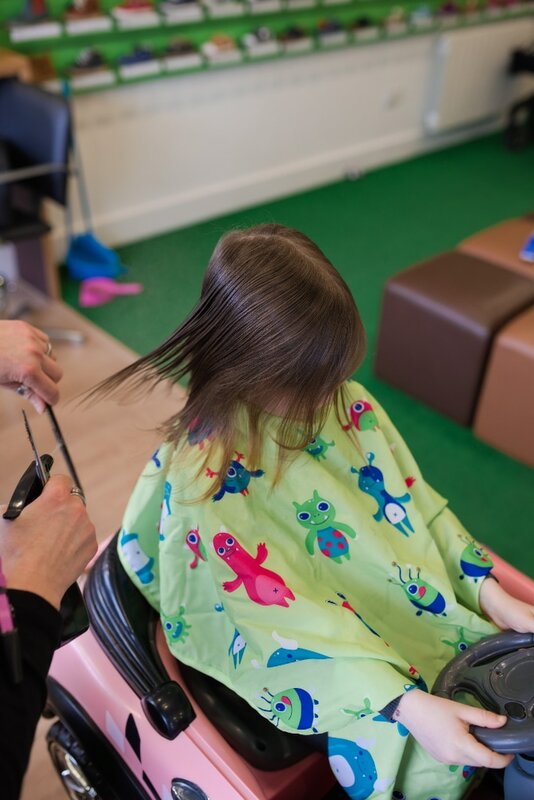 Your visit to Treehouse is more than just getting the little ones haircut….. we strive to create a fun and interactive experience for children, while being the one-stop-shop for parents’ needs. Our team are passionate and well-qualified in all areas of hairdressing, therefore, you can be confident your children are in safe hands. Having your child’s first haircut is a major milestone. To make it a special and memorable experience at Treehouse, we offer a keepsake certificate and their first lock of hair in a pouch. Don’t forget your camera! Our motto is that we will always try our best with helping each and every little one overcome their obstacles to get their haircut. We are aware that haircuts can be a frightening situations for many children but rest assured we are equipped for the challenge. If your child is upset or has a phobia about having their haircut, has sensory issues or stimulation sensitivities, we always encourage you to bring them in. All of our hairdressers are familiar with dealing with wriggly crying toddlers, and are well informed about the best ways to try to make the hairdressing experience as easy as possible. We can support further by arranging a private hair appointment before the store opens to give your child a quiet space. To discuss this further please contact our team on 0131 225 1242. BOOK AHEAD. Due to the popularity of our hairdressing service it is always better to book your appointment in advance, particularly during the weekends. ARRIVE EARLY. Please arrive about 5-10 minutes early to allow your little one to familiarize themselves with the environment, to ensure that they are prepared to start at the time of the appointment. AVIOD THE WORD ‘CUT’. Some children are frightened by the word ‘cut’ because they think they will be hurt. Alternatively, tell them they are coming for a ‘trim’ or a ‘snip’ as it sounds a little less scary. TALK IT UP. Always talk about the haircut days before, in simple terms about what’s going to happen and get them excited about it. Perhaps you could play hairdressers at home. The key is to build excitement around the haircut and not anxiety. BRING AN EXTRA T-SHIRT. We provide super hero capes to avoid little hairs getting on their skin, but not all little ones are keen to. Therefore, we always advise you to bring an extra t-shirt to get those tiny itchy hairs away from their skin. TIMING IS KEY. Prior to the hairdressing appointment ask yourself: do they need a nap? are they hungry? do they fear strangers? You know when the best time is for your child so please arrange a suitable appointment time. CREATE A DISTRACTION. Often with small children a distraction is necessary to get them through their haircut. We have a range of popular DVDs, but feel free to bring along your favourite one from home. Any other favourite toys, books, soothers and snacks all help as distractions too. RELAX. If you are tense then your child will be too. We don’t recommend forcing a child to have their haircut, as it will only create fear. We will never charge you, if a haircut does not take place. It will happen one day, as it’s a work in progress to help them relax into the environment.